A phone case isn’t the only accessory you can have for your smartphone. Sure, it’s one of the best ways to express yourself considering there are thousands of designs — and that’s not even including customisable, monogrammable cases. But we’re living in the age of AirPods, people! Your smartphone is as much of a design statement as your Balenciaga Triple S sneakers. To help you usher in this era of technology married with style, we’ve curated a list of the most stylish phone accessories you need to cop before everyone else does. The Louis Vuitton Horizon wireless earphones. Two years ago, the luxury fashion house Louis Vuitton entered the tech arena with the Tambour Horizon smartwatch. Now, they’re embracing technology once again by making their foray into the audio realm with the Horizon wireless earphones. 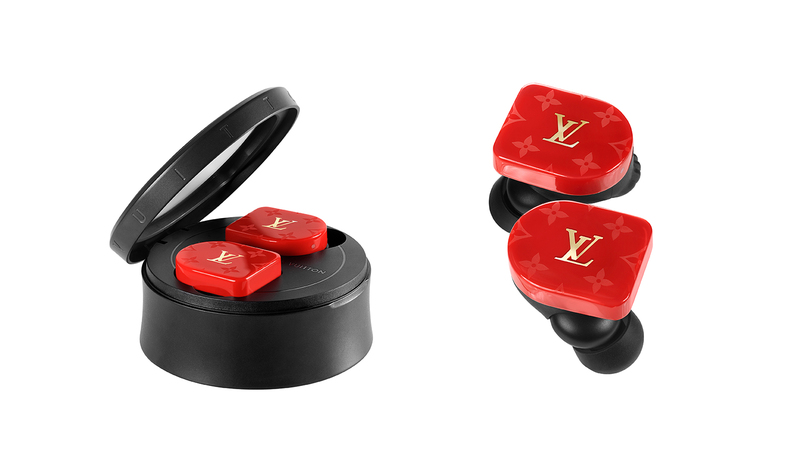 These truly wireless earbuds are designed in true Vuitton style. The signature monogram of the French maison is engraved onto the polished acetate body of the earphones. You can choose from four colourways – black, white, red, and yellow- and-blue striped – or you can just get all of them. The Horizon wireless earphones were developed in partnership with Master & Dynamic, audio specialists that are set on putting your AirPods to shame. The Louis Vuitton Horizon wireless earphones are retailing at S$1,580 at Louis Vuitton boutiques in Ngee Ann City, ION Orchard, Marina Bay Sands, and Changi Airport Terminal 3. Rimowa’s iPhone cases bear the signature grooves. Do you know what would be rad to accompany your assortment of Rimowa suitcases? A Rimowa iPhone case that bears the unmistakable grooves. Coming in either the classic brushed silver or pink, this iPhone case will stoke the envy of all your fellow jet setting peers. In case you were wondering, yes, it’s made from the same hardy aluminium shell as their luggage. If you have butter fingers and clumsy palms, the shockproof thermoplastic polyurethane grip will save you many a heart attack, protecting your phone from any drops. Alexander Wang holding up his Popsocket. How many times have you used your phone in bed and let it slip from your grasp – and on to your waiting face? Don’t worry, we’ve all been there, which is why the company Popsockets was founded. Adding an expandable grip to the back of your phone makes gripping it a whole lot easier. Last year for his “Collection 2” fashion show, the Alexander Wang announced a partnership with Popsockets and (RED) in support of World AIDS Day. For each purchase of an Alexander Wang Popsocket grip, 50% of the proceeds will benefit the global fight towards eliminating HIV/AIDS. It’s killing two bird with one stone! Kim Jones’ AirPods holders on the Dior Men’s Winter 2019 runway. If you’re a proud AirPods owner, then you must know the little doses of anxiety you get whenever you can’t find them, or when they’ve jiggled out of your ear. Kim Jones knows that his endearing fans have all jumped aboard the wireless earbuds fad, and designed an AirPods holder that was previewed on the Dior Men’s Winter 2019 runway (or travelator). These holders can be worn around your neck like a pendant or clipped to your belt, ensuring you won’t ever misplace your set of the hottest tech accessory ever again (we know someone who has bought four AirPods since they came out). Unfortunately, you’d have to wait till later in the year for these holders to drop in stores. Hopefully, Apple would have updated the AirPods in time. The Berluti and Native Union portable phone charger. We’re not sure why anyone would need a phone charger that costs upwards of S$1,000, but when you’re forking out more than that for your phone, it’s a worthy investment. The storied leather specialists Berluti have partnered with Native Union on a capsule collection for their UHNW clientele. There’s both a wireless charger and a portable charger outfitted in the French house’s signature patina leather. For the price you’re paying, you’ll also get a slew of accessories for the accessory. The portable charger comes with two- and three-pin adaptors and leather-sleeved cables in a beautiful leather box. There’s also a dust bag included to protect the fine calf leather. The Berluti x Native Union accessories are available on Mr Porter. Both the portable charger and the wireless charger are priced at S$1,180.